The Wisconsin State Law Library, Milwaukee Legal Resource Center, and Dane County Legal Resource Center will be closed on Monday, September 1st in observance of Labor Day. To send a question to the Wisconsin State Law Library while we are closed, you may call us at 608-267-9696 or Ask a Librarian online. We will respond to questions and requests on Tuesday, September 2nd. We are starting up our webinars for the fall and first up is a CLE class on a new database, Index to Legal Periodicals. Learn how to use this database and get tips to maximize your search efficiency. The class features research examples grounded in practical, real-world questions. There's still space in our Tuesday, August 26th noon class, so register today and learn more on our Classes page! The Federal Depository Library Program hosts several free webinars throughout the year. Each webinar focuses on a different Federal database or resource. You can register online and attend for free. If you missed a webinar or they already covered a topic, you can catch up with archived sessions in this federal agency webinar archive. Milwaukee Legal Resource Center staff have been hard at work setting up in their new space. We post the first pictures of the move in our August newsletter. Also in this issue, learn about major updates to the State Bar of Wisconsin's Law of Damages, new Wikipedia editing guidelines, and new book from the State Bar, Wisconsin Trust Code: with Legislative Reference Bureau Analysis. Don't miss our Odds 'n' Endings spotlight on BadgerLink, a large collection of databases made available to Wisconsin users for free. 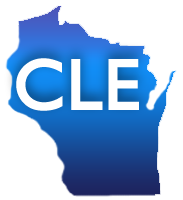 As always, we write to remind you about our CLE classes - many offered for free. Get more information and sign up for late summer and early fall on our Classes page.